What Causes Loss Of Water Pressure When Toilet Is Flushed? A loss in water pressure throughout the house. Toilets are connected to the main water line so if there's a water pressure problem in the main line, then you will have a problem with the toilet. 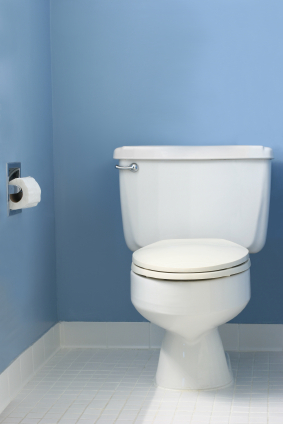 The toilet itself may be the cause of the loss of water pressure. So, how do you identify which of these is the cause of the decreased water pressure? There's a very easy test to see if the problem is coming from the toilet or elsewhere. Turn the bathroom sink faucet on (cold water only) as high as you can and leave it running. Did you notice the water pressure in the sink go down? If the answer is yes, then the problem is coming from your toilet. Finally, if you've tried everything else and you're still experiencing low water pressure - the problem may be in your pipes. You will need professional plumbers to come in and inspect the pipes in your home to find where the problem specifically is. You may need pipe repair or replacement. Is The Toilet Causing The Low Pressure? If you find out that your toilet is causing the low water pressure - there are a few things that you can do. Check that the water valve (usually located on the wall behind the toilet) is turned on all the way. Adjust the float inside the toilet tank. You want to make sure that there's enough water in the tank and if the float is not working properly, you could end up with less water than you need. The water level in the tank should be sitting about 1 inch below the overflow tube. Under the lip of every toilet are a series of very small holes. Because they are small they can easily be clogged. Use a brush to scrub them clean and clear out any clogs that may be there. If it's an older toilet - you may have to resort to purchasing a new one. Older toilets can lose their "oomph" as the years go by. Why Does My Toilet Vibrate After Flushing? Why Does Flushing The Toilet Make The Shower Cold? If you have any questions about water pressure problems, call Atlantis Plumbing today at 770-505-8570. We are available 24 hours a day, 7 days a week.